Tabacalera Perdomo is a company built on three distinct pillars: quality, tradition and excellence. The story of the Perdomo Cigar brand goes all the way back to San Jose de Las Lajas in Cuba. This industrial and agricultural municipality is just southeast of Havana, and the birthplace of Silvio Perdomo. He got his start by apprenticing at Cuesta y Cia, then in the early 1930’s Silvio left to begin practicing his love at the H. Upmann factory until 1945. From there he went on to the famous Partagas factory for the next fourteen years. This is where his son Nick was born, and began following in the footsteps of his father. Both father and son began to receive recognition for their skilled work, until Castro destroyed their freedom, lives, and eventually the country they loved so much. After being imprisoned during the communist revolution, Silvio suffered over a decade of torture in the worst conditions in four different deplorable prisons. His son Nick was also the target of the new Castro party, having been ambushed and shot by Castro guerillas, but managed to escape Cuba and make his way to America where he was able to use his new-found freedom to work again on fulfilling his passion for cigars. Eventually settling in Miami Florida, Nick Perdomo started making Perdomo cigars in his garage back in 1992. Originally called Nick’s Cigar Company, he set his brand apart from others by using robust wrappers and fillers from Central America and Ecuador. After decades of difficult challenges, the Perdomo Cigar brand has become one of the leading makers in the industry. Today the cigars are manufactured in Esteli Nicaragua in an 88,000 square foot building dubbed El Monstro. Since those humble beginnings in Miami Florida, the brand is responsible for putting out countless impressive cigar lines that continue to receive acclaim and awards for excellence. The Perdomo brand manufactures a wide array of different style cigars from mild to full-bodied, with a huge variety of wrappers. Considered one of the Premium Cigar Brands in the world, you can purchase all the popular Perdomo cigars here in our Edmonton tobacco shop. The current line of Perdomo cigars is vast to say the least. With something for just about everyone, many of the current cigars in the line-up have received awards for their incredible taste and value. The Reserve Habano Connecticut received a 94 rating by Smoke Magazine. Cigar Aficionado awarded a 92 rating to the Perdomo 20th Anniversary Sun Grown Churchill. Cigar Journal presented the family of the Perdomo Cigar company their trophy for best value Nicaragua cigar in 2012, then they repeated this impressive feat by winning the award back to back years in 2013. 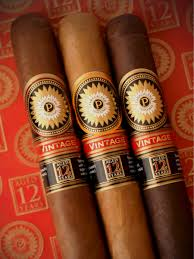 Perdomo recently introduced “Perdomo Double Aged 12 Year Vintage” in 3 wrappers Connecticut, Sungrown and Maduro and we carry them in our Edmonton Tobacco Shop. These cigars use a special double-aging process starting with rare tobacco that is aged for ten years and then barrel aged for two additional years. The Perdomo family has endured their share of hardship, but through it all, the dream of bringing one of the best cigar brands to the world flourished. Each year Perdomo Cigars are recognized as a leader in the cigar world, and each year their popularity grows with cigar aficionados.